After the little birthday dinner we woke up Sunday morning and drove down to Carmel. We are so fortunate to live in a place that has the best weekend trips. We usually go north to wine country or out to the coast but lately we have been gravitating to Carmel lately. We stayed at the Carmel Valley Ranch and it was spectacular. (Side note to California residents - they give a huge discount to California residents on Sunday nights). We drove down to Big Sur Bakery for dinner which for the record is one of my favorite restaurants. It is literally right next to a gas station but has the most delicious fresh, California inspired food that I love (I also adore their cookbook, it is one of my favorites). So what does this beautiful ahi tuna poke bowl have to do with my crazy life? Well besides the fact that it is gorgeous and delicious - I tend to not eat the healthiest when life gets bonkers. I am dreaming about some time on my couch and a large poke bowl to balance me out, because it is all about balance right, unfortunately we can't have birthday cake for breakfast everyday. 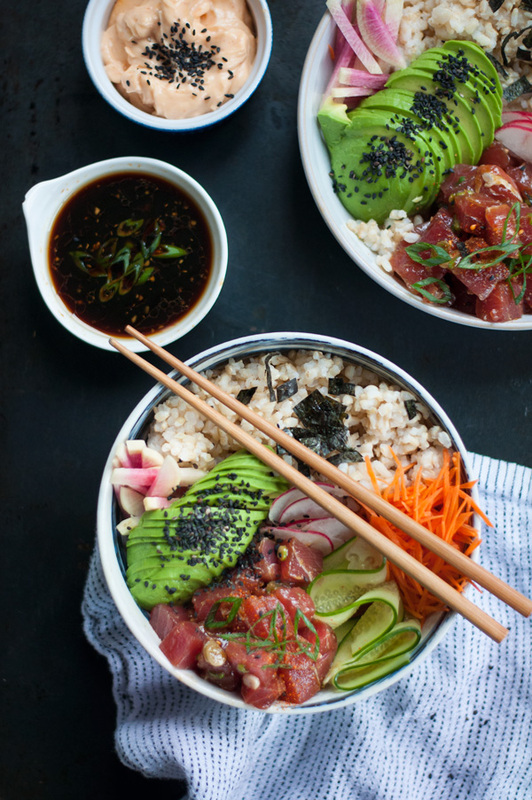 Poke (poh-Kay) bowls are just fancy terms for a rice bowl made with raw fish that has been marinated in lots of flavors. I chose tuna for this recipe but salmon would work just as well. When making this recipe, please be sure to get good quality fish, especially since you re eating it raw (For those in Oakland I am obsessed with Hapuku Fish Shop in Market Hall but email me if you have any questions about buying raw fish) Serve the poke with all sorts of veggies and brown rice for a healthy and beautiful meal. **So I have to put this disclaimer because I know my Dad reads this site (Hi Dad!) and since we grew up in Florida Dad always taught us the importance of knowing the impact of your choices, especially when it came to fish. Although I love tuna, the population of tuna is dwindling - that doesn't mean you can't eat it, but just make sure you are getting it from a respectful source - my tuna was line-caught off the coast of Hawaii - and eat it sparingly. Ok thanks for letting me share my PSA so I can show my Dad that I did indeed listen to him while I was growing up. 1/2 lb high quality ahi tuna, diced 1"
In a large bowl whisk to combine the soy sauce, sesame oil, rice wine vinegar and green onions. Add the tuna and gently toss to combine. Refrigerate poke for 2 hours or up 24 hours. 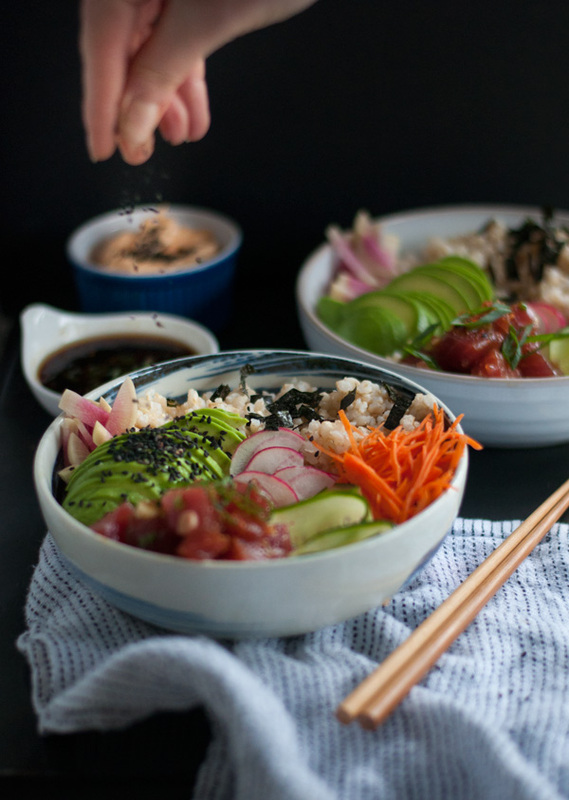 Serve poke in a bowl alongside rice, avocado, carrots, cucumber, radish and sesame seeds. ****you may want to serve it with extra sauce, in that case, double the amount of soy sauce, sesame oil and mirin and reserve half for serving.